When you think truly iconic glasses & sunglasses (so iconic, in fact, that they have been worn by the likes of fab femmes Jackie O’ & Iris Apfel) you probably already think of Friedrich’s Optik. They have stores all over the world, but a lot of people don’t know they also have a brick and mortar right here in Charleston on lower King Street! This post is in partnership with Friedrich’s Optik, but all opinions are my own. 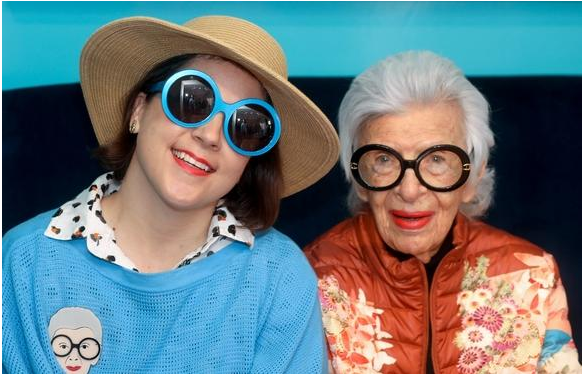 I recently went to Palm Beach to meet Iris Apfel, so I had to stop in the Friedrich’s store there so I could twin with this stylish lady. How cute is SHE?! My life has basically been made because we were even in the Palm Beach Daily News together (as seen in the photo below left). 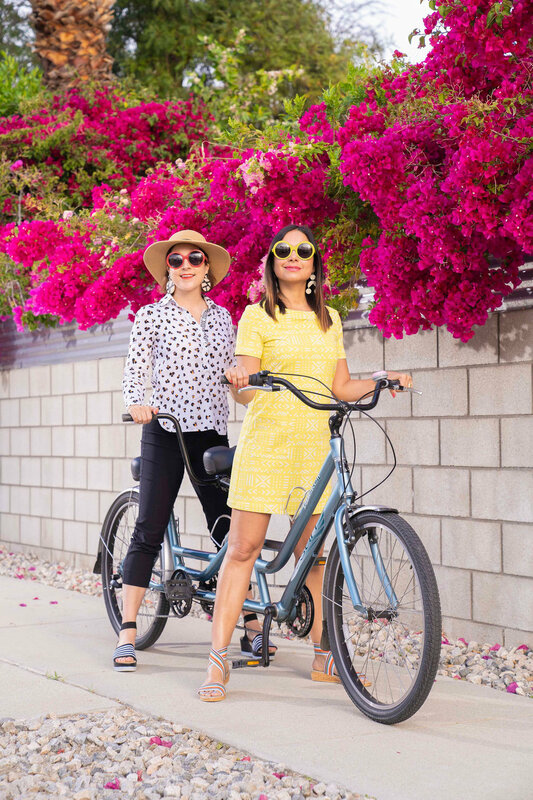 The following week, my friend Andrea and I were so thrilled to get to borrow several cute Friedrich’s styles that we took on our Palm Springs trip with us. We felt like the most fabulous queens in our shades; I’m talking movie star status! If you need prescription sunglasses like I do, Friedrich’s can take care of that for you. They also have plenty of gorgeous styles of regular glasses to choose from. Have a look at some of the styles we sported during our trip! After trying less expensive, mass produced glasses brands like Warby Parker (and being disappointed in them), I’ve come to the conclusion that you definitely get what you pay for! Glasses are something I wear nearly every day, so it’s really worth the investment to get a pair that will last. Plus, when you learn about the materials Friedrich’s uses to create their iconic frames, you understand what a wonderful value they really are. Silk is what gives them their vibrant colors, and the frames are made from buffalo horn (which is plentiful in Germany)! Another added bonus of shopping with Friedrich’s is that you are supporting a family operated business that will likely be around for generations to come. You really get what you pay and can feel great about your purchase when you support small businesses like theirs! Check out some of the fab Friedrich’s styles my pal Andrea was rocking during our trip, and follow us on Instagram at The Curated Weekend to see more of our joint adventures & fun with fashion! Rainy Charleston days can really bring me down, because we are mostly used to sunshine around these parts! If you do happen to find yourself here during a visit to Charleston when it’s rainy, have a look at some of my recommendations for what to see and do to ensure you still have an enjoyable visit. Of course I hope you’ll check out our shop, Cannonborpugh Collective! It’s kind of always sunny inside because we usually have a balloon wall installation & plenty of cute gifts to make you smile. We also have adorable colorful umbrellas! There are plenty of other cute shops all over town, of course! Skinny Dip has a lot of light coming through upstairs, so I never mind working from their upstairs coffee shop when it rains! The Community is a great spot to go grab gifts or pick up a cute card, and Indigo Market is always dressed to the nines with their reclaimed vintage furniture. Since we are such a foodie-filled city, you can find several cooking classes around town. You can check out In The Kitchen With Bob, but I hear it fills up quick . Another favorite class of mine is the Candlefish candle making classes. 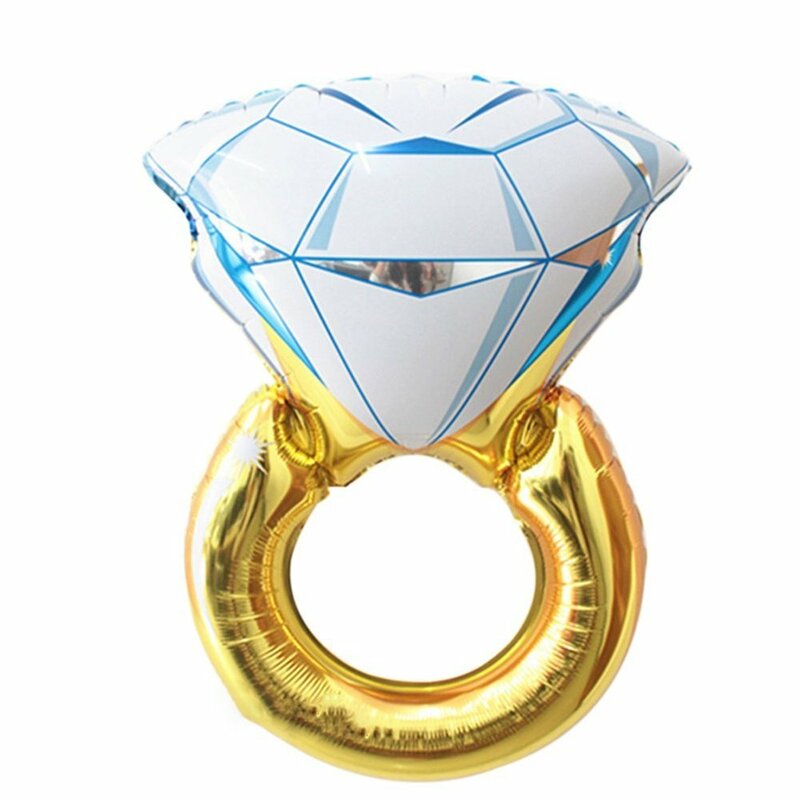 You can BYOB while you hone your chandling skills! Some of my favorite cozy cafes are: 132 Spring, The Harbinger, The Daily at the Gibbes, and Gnome Cafe. Having an adult beverage or even a meal during a movie can make your cinema experience that much more fun! I certainly don’t go to Cinebarre just for the food (sorry to say it’s never blown my socks off), but it is a nice convenience to be able to order food while you catch a flick. My husband and I usually prefer to attend movies at Terrace Theatre, where I often get a Guinness while I watch. The adorable Charleston Flower Market is next door, and there are 2 good restaurants in the same shopping center; Zia Taqueria and Crust Wood Fired Pizza. Not only is the Citadel Mall an IMAX theatre, I hear it also has big comfy chairs that recline all the way; perhaps you can skip the food & bev and opt for rainy day relaxation instead. This kind of activity sounds like a bit of a claustrophobia nightmare to me, but I guess it could be a fun way to spend the afternoon if your down for being locked in a room for an hour! Downtown we have Break Out Charleston, Escape in 60, & Time Traveler Escape Games. The Gibbes Museum of Art recently underwent a renovation, and the gift shop alone might be worth the trip! There are also so many cute art galleries in the French Quarter area of downtown, so check out some of those. I would start at Robert Lange Studios and then make your way to the galleries on State & Church streets. There are a plethora of places to see an entertaining show. Theatre 99 is great if you long to laugh, or Dock Street Theatre and Sottile Theatre usually have good offerings for the live performance lovers out there. If you want cute-sy decor & non-toxic salons, grab a pal & check out Mylk Bar or The Water Room. I also love Lu.Nu.La Nail Lab, which is more of a 1:1 studio; the owner is super talented if you want some trendy nail art! I don’t have any munchkins of my own yet, but for something fun for the whole family I would recommend The Aquarium, The Children’s Museum, or The Alley (bowling & arcade games). and check out my Charleston Guide for more things to do around the Holy City! Since March was Women’s History Month, I kind of think I want to keep the lady love going strong! 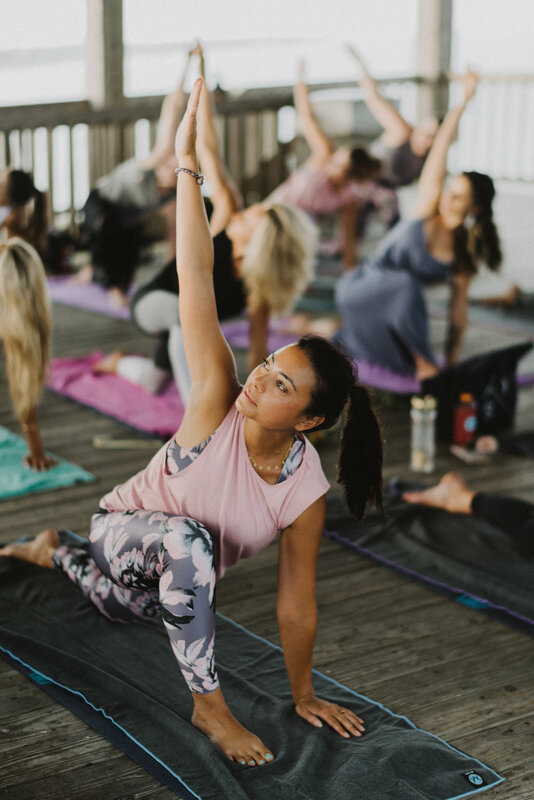 I also have a Girliest Spots in Charleston post you might like so be sure to check that one out, but first I wanted to share some great ladies with you. I either met or encountered all of these ladies at the Charleston Wine & Food Festival, and they are doing some amazing things in the Food + Beverage industry! I’ll share the events they were involved in, too, so you can try to catch them next year. Holistic Life Coach Elli Richter always delivers a dose of good vibes at any event she participates in. She led a beautiful guided meditation during “RetrEAT”, where we also dished on our relationship with food with Ayurvedic Health Counselor Caryn Ohara. The concept of healing through food is novel for some despite it’s ancient beginnings; I truly believe you can “heal your gut & change your life”! Um yeah, Callie’s founder Carrie Morey is pretty much the queen the biscuits! She’s also been churning out a bunch of fun collaborations (recently teamed up with A Packed Party & topped her biscuits with sprinkles). Callie’s also recently added a gluten free option to their market location, so I can’t wait to check that out! During CHSWFF, we got to make biscuits with her for our family style dinner at an event called “Lunch Squad”. Carrie usually does a biscuit making event where I’ve picked up LOTS of pointers, so keep an eye out for that for next year as well! There are plenty of names you have heard of when it comes to bbq. Most of those names are men, but do you understand what is happening here folks? The ladies are taking over! Yasssss. The gang of gals that dubbed themselves “We Only Smoke When We Drink” took charge of the smokers and their gents hung back to sous chef for them! How cool is that?! Local lady Christian Jackson Holy City Hogs & Delaniah Bringle of Peg Leg Porker in Nashville are two gals to keep on your radar! But also, many of these ladies love and respect their husbands in a really cool way. And visa versa. But, it’s just their time to shine right now so watch out for what’s to come with this gang. I predict we will also continue to see more ladies involved in the craft beer and bourbon scene as well! 4. Tiffany Thiessen; yep, the lady formerly known as Tiffani AMBER Thiessen and now cookbook author! For the past few years, Tiffani has been hosting a Cooking Channel show, and recently released her own cookbook, Pull Up a Chair. Thanks to my friends at Le Creuset & I Love That For You, I got to meet this fantastic woman! Her autograph in my cookbook reads “Liz, you’re not one to forget”. Bahahah I’ll take it!! 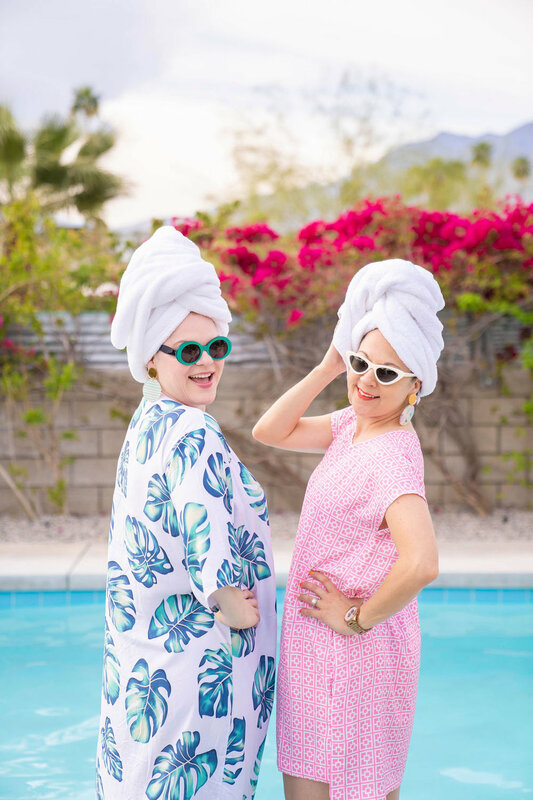 Andrea of Charleston Shop Curator & I just got back from a trip to Palm Springs together for a whole week, so go see what we were up to at @TheCuratedWeekend! There is usually lots of food involved regardless of when or where we get together, and we are some serious Meg Ryan dinner dates (a la When Harry Met Sally). Well, not THAT scene from WHMS, more like the scene where she’s being a little particular when she orders her food. We can’t help it we have complicated dietary restrictions slash preferences ok?! But for real, this lady is a super duper inspiration to me and is such a great cheerleader when I need it most! We feed off of each other’s energy and lift each other up. If you don’t have a friend that does that for you then keep looking! 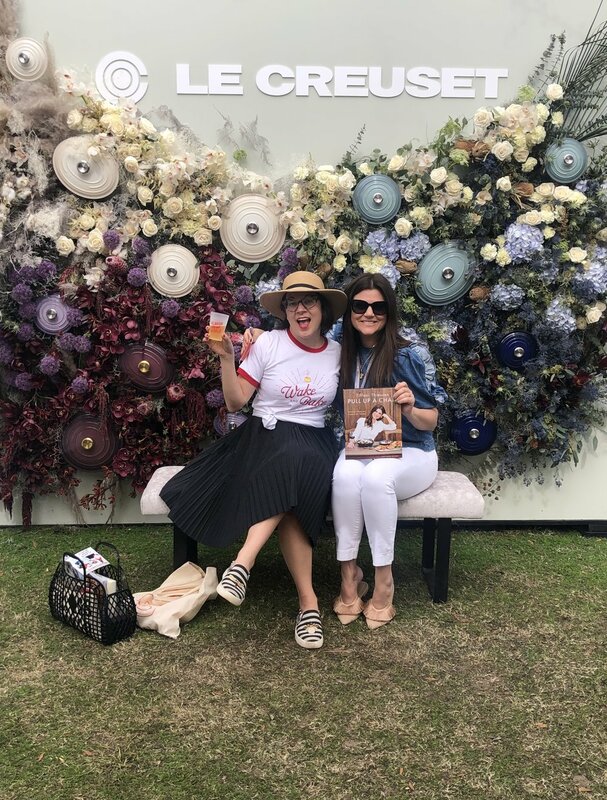 Each year, the Charleston Wine & Food Festival seriously gets better and the featured chefs/talents get even cooler, so make sure you follow them on Instagram to stay in the loop about the 2020 festival! Thank you so much to the CHSWFF for letting me be part of it as a 2019 #CHSWFFStreetTeam member- it’s truly my favorite local gig of the entire year. You will rarely find me in heels, and I’m really not the most girly-girl when it comes to hair and make-up. However, I sure do love to get together with the gals and go to a super adorable space whenever possible. 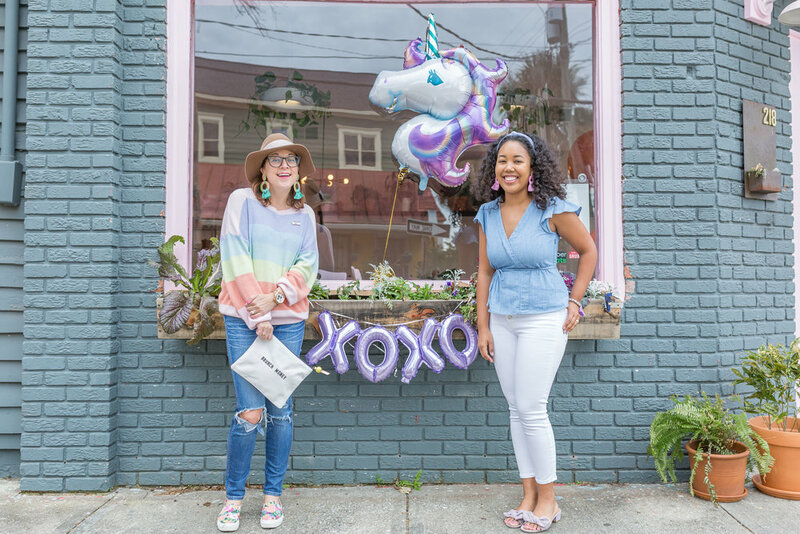 Here are the most girly shops & restaurants around Charleston, which you’ll enjoy whether you’re here for a bachelorette or just wanting to treat yourself to some holy city cuteness! This modern Mexican-inspired gem is just popping with pink! If you love the Instagram account @PlantsonPink, you’ll feel like you stepped into one of their posts when you go to Semilla. Bonus: the food is phenomenal (best ribs in town)! This gorge champagne bar is nestled inside the fancy new Hotel Bennett. An opulent chandelier, fresh flowers, and plenty of pink will have you ogling your surroundings while you sip your bubbly. Now that we’ve expanded our shop and taken over the next door space, we have even more pops of pink and cute new merchandise for you to browse! As always, we have plenty of girly balloons like unicorns. I’ve also expanded my offerings to include more home decor & entertaining items, so I hope you’ll stop by soon to have a look. I just love this adorable back room at Jude Connally on King Street! Prior to developing her clothing line, Jude was an interior designer and you can certainly tell by the way she decorated her store. 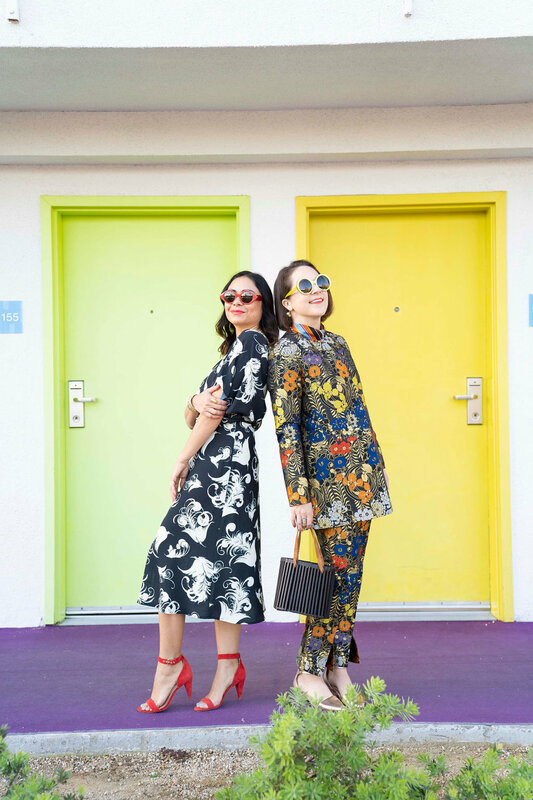 BONUS: Jude really knows how to design clothing that makes any woman feel amazing; you’ll go gaga for her prints! 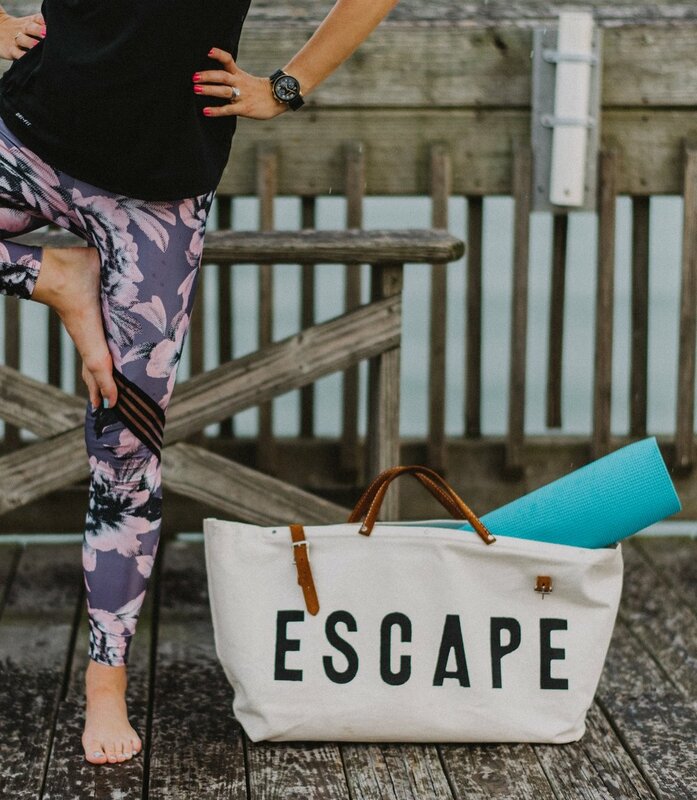 You probably already know where to go the next time you have a hankering for frosé, and you’ll love shopping their brands like Sail to Sable and August Morgan! This adorable new kid on the block is stocked with all kind of brands from home decor items to skin care. They have cute offerings for kids as well. If you like a little Instagram-friendly moment to go with your mani, you’ve found the right place! There’s now a downtown location of this cute dry bar. I love how their branding is full of pink and puns! Bonus: enjoy champagne while you get your hair did! You’ll love the vintage and vintage inspired jewelry in this cute little shop, and it’s just right down the street from Cannonborough Collective. that I missed, and follow along on Instagram for more of my Charleston recs! One of the questions I get DM'd about the most on Instagram is, "What should I do for my bachelorette party in Charleston?" 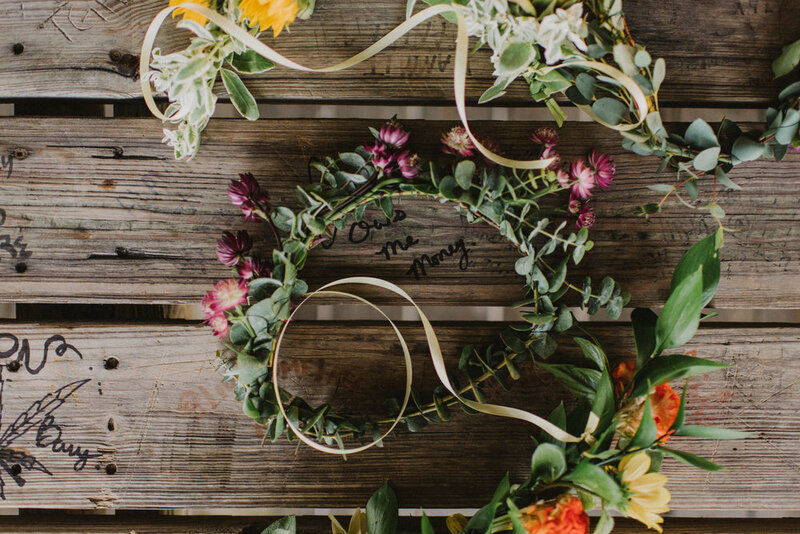 I've given this one a LOT of thought, so I have a great round-up of ideas that I think you and your girls will love. 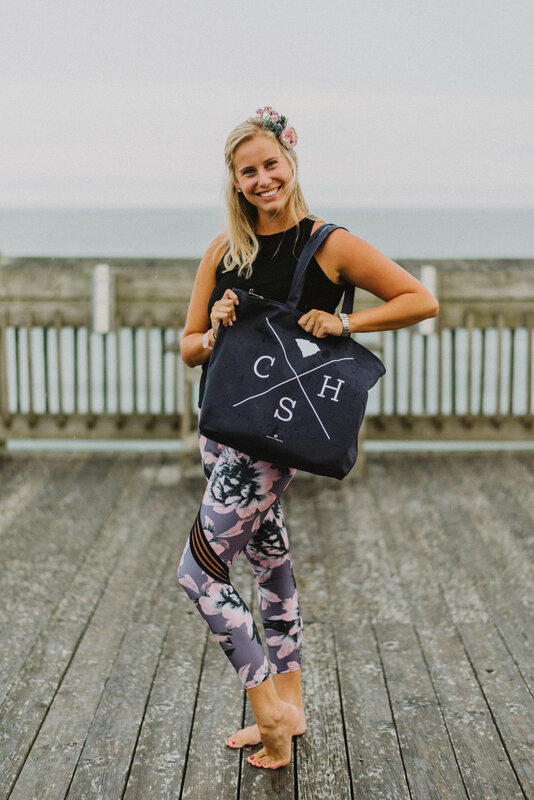 Also be sure to get in touch if you want to set up a private sip & shop or workshop at our store, Cannonborough Collective! There are SO many restaurants to choose from in this foodie haven of ours! Here are my recommendations for the best restaurants to accommodate larger groups. 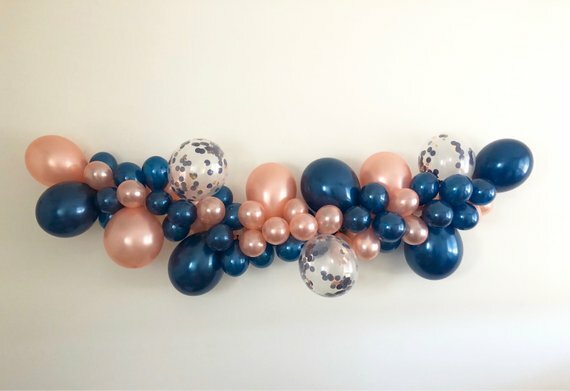 Call ahead at Cannonborough Collective to line up a balloon pick-up, or shop below for some cute options you can fill yourself with air (the following links are affiliate links which will earn me a small commission).